Jin Shin Acutouch is a quiet bodywork pattern with gentle touches that increase energy throughout the body to activate self healing and change.It is thought to be the "Mother of All Healing Arts." Jin Shin Acutouch is a combination of Jin Shin Jyutsu, Five Element Theory and other eastern Medicine principles. 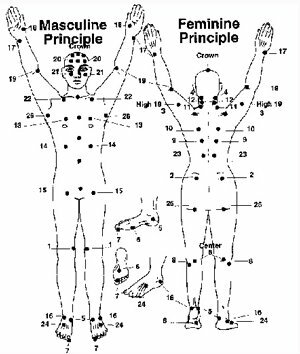 There are 26 major points on each side of the body and nine center chakras that keep the body in its natural state of balance. When energy is not moving freely in the body, 'dis-ease' can appear in the body either physically,emotionally,or mentally. The practitioner's hands activate the client's energy by holding two points or areas on the body at the same time for one to five minutes. They act as 'jumper cables" bringing charged energy to the body. The points are touched in a specific pattern or flow to help release blockages and move stagnation in the body. This bodywork has a holistic approach. The practitioner looks at everything by looking,listening,smelling,asking and touching. Because every person is different, the sessions vary from 90-120 minutes.